Two new Air Force One aircraft are still projected to cost $4 billion, despite President Trump’s claims he negotiated with Boeing to take $1 billion off the price tag, Pentagon documents reveal. The figures appear in a document released as part of the U.S. Defense Department’s 2019 budget proposal. They provide the U.S. Air Force’s first public update on the planes’ projected cost since last May. Service officials and Boeing — which makes the planes and will oversee their transformation into a flying White House — say they are still looking for ways to lower the price. 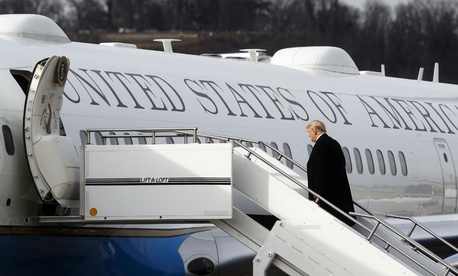 "We continue working with the Air Force towards a best value approach to the [Air Force One] program,” said Todd Blecher, a Boeing spokesman. The document — formally, Research, Development, Test & Evaluation, Air Force, Vol. 2 — indicates that the Air Force has already paid $1 billion to Boeing for two airframes and the engineering work needed in advance of their conversion into a VIP configuration. It says the service expects to spend another $2.9 billion between 2019 and 2023 on the two planes. And it says that the “cost to complete” is “continuing” — a sign that more money would be needed beyond the five-year budget proposal. The Air Force, in its budget proposal sent to Congress this week, asks lawmakers to approve $673 million for some modification work that would be done fiscal 2019. While last year’s Air Force budget proposal boasted about saving $191.6 million on the project, this year’s mentions no such savings. The numbers listed in the document for fiscal 2020 through 2023 are just projections and are subject to change, Ann Stefanek, an Air Force spokeswoman said. Privately, service officials say that the only way to substantially cut costs on the two-of-a-kind planes is to change the requirements for them, and hence reduce the amount of custom, expensive modification work. To date, the only major change is to eliminate a requirement for the plane to refuel in flight. The high price tag for the new Air Force One first drew scorn from Trump as president-elect when he called the $4.4 billion price tag “out of control” in December 2016. But the president's tone changed quickly after meeting several times with Boeing CEO Dennis Muilenburg. By February, Trump was boasting that he had cut more than $1 billion off that price tag after an hour of negotiations. But experts say the planes’ high cost is driven by their uniqueness, the custom modifications that allow the president to maintain connections to the military and American people during war and peacetime. Last month, for example, it was revealed that Boeing was paid nearly $24 million to install two new refrigerators on the current Air Force One. The current Air Force Ones, which the military designates as VC-25As, were delivered in the early 1990s. The planes are spending more and more time being overhauled to remain in tip-top condition, according to the Air Force’s budget proposal. In fact, it takes “well over a year for heavy maintenance” to keep the plane in compliance with Federal Aviation Administration standards.